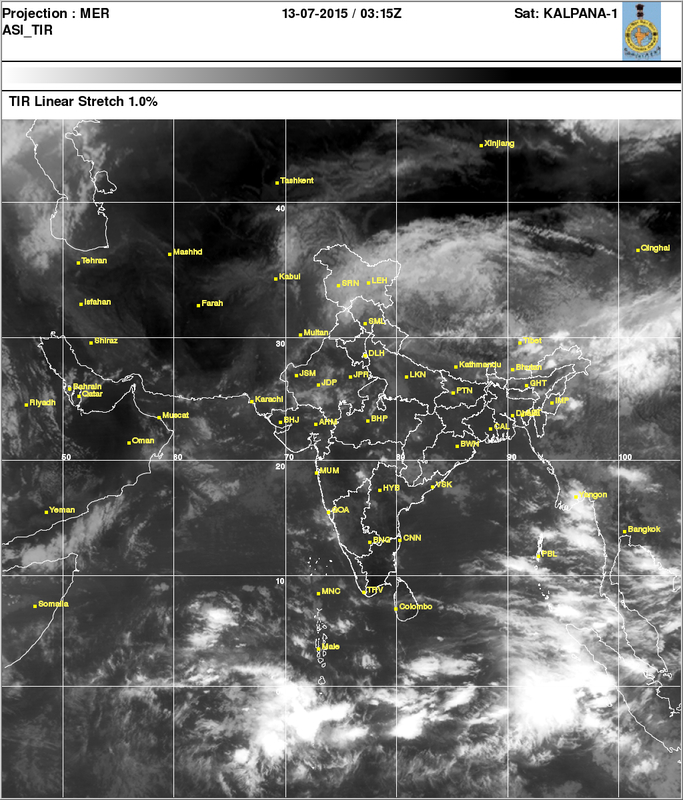 Fresh Bright Start to a Monday Morning ..Sat Image of Monday 13th July..! If we take 33% for leakages, wastage, evaporation etc, we have 409 Mcum balance for distribution...and taking supply at 3.75 Mcum per day, Mumbai has 109 days supply. Pune Region has total Storage facilities of 10266 Mcum, while on 11th, 3100 Mcum is filled, that is 30% is available. The Lowest is in Marathwada. Total storage...7603...Available 493...6% Storage available. Total Maharashtra Storage of all Dams and reservoirs in Mcum 37463, Storage as on 11th July 9756....26% Storage filled. 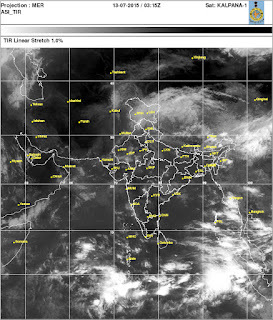 Mumbai : Monday and Tuesday:Partly sunny day. A couple of passing showers possible in some parts. Around 5-8 mms in the day. Pune : Monday and Tuesday will be Partly sunny with a few light showers in some areas. So July turning out to be as forecasted by you against other weather forecasting agencies. Sir do u see any panic at this time for Maharashtra as a state and entire country as a whole? Nilay...when i put up the exact position tinite, you will see Northern regions are doing well. Panic not seen in country as a whole...Maharshtra...well...lets see in the end of July how things shape up. New Low expected, but track ? Agreed with Neelay. Waiting badly for you post and hoping that axis is favorable for deficient region like maharashtra,kar,kel etc.